This friary was founded in 1460 A.D. and functioned until its Suppression in 1540. The house was destroyed in 1582 by English forces, and the Franciscan community was dispersed. The friars returned c.1642, 1650 and again from 1661 on but there was no community by 1766. Nothing remains but a doorway belonging to the friary is believed to be preserved at Lett's brewery. The River Slaney which flows through Enniscorthy belongs to the Slaney River Valley SAC and pNHA. This SAC connects southwest Co. Wicklow and the Slaney's tributory rivers to Wexford town where the Slaney enters the sea. Enniscorthy has short walks along the river and two heritage town trails guiding visitors to its historic Norman castle and the Catholic cathedral designed by Augustus Welby Pugin. St. Francis friary was founded in 1233 AD., and flourished until the friars were expelled in 1559. They returned in 1612, and continued to minister under cover . The last friar died here in 1829. The famous Friar John Clyn who wrote about the ravages of the Black Death in the area died from plague here in 1349. Today, only the roofless friary church and tower remain with some charming stone carvings beneath the tower. The ruins are situated on property owned by a modern working brewery. The historic medieval city of Kilkenny is built on the banks of the River Nore, and the friary is situated on the western bank. The river is part of River Barrow and River Nore SAC, and the River Nore itself is a SPA. There is much to see and enjoy in this historic city with an ancient cathedral and round tower, other medieval churches, a medieval house, a castle, remnants of the town walls, other historic houses and public gardens. Irish Franciscan friars were chaplains at St. Patrick's Purgatory on Lough Derg from c.1630 to 1780, and this is why the Franciscan Crown or Rosary of the Seven Joys (seven decades), a Franciscan devotion is recited as part of the pilgrimage to this day. The friars built a small friary and oratory dedicated to St. Mary of the Angels - the title of the famous Franciscan basilica - Santa Maria degli Angeli - in Assisi, Italy. Click here to find out more about pilgrimages on Lough Derg. Lough Derg on which St. Patrick's Purgatory is situated is very beautiful and is the Lough Derg (Donegal) SAC, SPA and pNHA. Right next to this special place to the west is another special area, the extensive Dunragh Loughs/Pettigo Plateau SAC, SPA, and pNHA and the Pettigo Nature Reserve. This site is also a CORINE Biotope site. The Nature Reserve and SPA is a Ramsar site, and also forms part of the Council of Europe's network of biogenetic reserves. Approximately 2 kms southwest of Lough Derg is the Lough Fad Bog NHA. A few kilometres to the east is the Lough Nageage SAC. Other protected sites in this area can be found at www.npws.ie. Founded in 1260 AD but the friars were expelled and buildings destroyed under Elizabeth I. The friars built a new house c.1632, and stayed on until c.1750 but it was vacant in 1766. Only the church nave remains today. Although the friary is situated in the middle of Nenagh town, it is tucked away behind the main streets and adjacent to a town carpark. A small lawned area beside the friary is kept very tidy but it is difficult to find wild flora. Nenagh castle has been recently restored and is now open to the public. This Franciscan friary founded in 1460 AD is located up from the harbour on Sherkin Island off the coast of Ballimore village, Co. Cork. It was plundered and burnt in 1538, but repaired in 1627. A single friar is mentioned here in 1766. 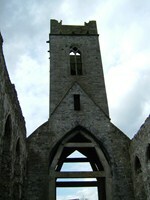 The ruins of the friary are substantial with the layout intact though the cloister is at most a low wall. The location on this beautiful island is ideal for reflection and a quiet break away from the hustle-and-bustle of modern life. The friary is in the very extensive Roaringwater Bay and Islands SAC and the somewhat smaller Roaringwater Bay and Islands pNHA. The deservedly celebrated marine research centre, Sherkin Island Marine Station is based here. Around the adjacent southern Baltimore coast is the Sheep's Head to Toe Head SPA. This friary, a few kilometres east of the town of Strabane, was founded c.1661 to provide for friars who were away from their own friaries while questing for alms. Friaries in the northwest of Ireland were few and distant from one another. While there was no longer a friary community in Strabane in 1766, individual friars may have remained for a little longer. Strabane is in Co. Tyrone whereas across the Finn Valley where the River Finn and River Mourne meet to form the River Foyle is Lifford, Co. Donegal. The River Mourne flows through the centre of Strabane town. Both the Mourne and the Finn rivers are part of the River Foyle and Tributaries SAC. The River Finn is itself also a Special Area of Conservation (SAC). O let the earth bless the Lord. To him be highest glory and praise forever! This friary was founded in c.1265 A.D., and functioned until 1552 when it was confiscated from the friars, and turned into a courthouse. The friars returned c.1635 and again in 1659. A friar was still there in 1744 but it was vacant in 1766. Only part of the friary church and transept are extant, and is now in the parish priest's garden. A short distance from the friary ruins is the southern part of The Murrough SPA which extends northwards along the Co. Wicklow coast as far as Kilcoole. About 1 kilometre approximately north of the site is the southern end of The Murrough Wetlands SAC which extends northwards beyond Kilcoole. The Murrough pNHA also extends from Wicklow town northwards along the coast. Another pNHA is in the vicinity of the pier and the ruins of the Black Castle. Less than 2 kilometres south east of the friary is Wicklow Head SPA and pNHA, and offshore is a marine SAC. Wicklow's historic gaol is also well worth a visit. This friary was founded in 1460 A.D. and functioned until the Suppression in 1540. The house was destroyed in 1582 by English forces. The friars returned c.1642, 1650 and again from 1661 on but abandoned it by 1766. Nothing remains but a doorway at Lett's brewery as the building fabric was used to build other structures in the town.